ONI Bureau: In yet another case of poor road connectivity, a pregnant woman carried on a cot to cross a river to reach the ambulance at Chaulagheri village in Bangiriposhi block of Mayurbhanj district. 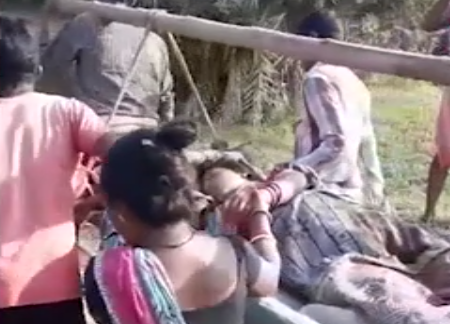 As per report, the woman identified as Jhumi Singh, complained of labour pain early today following which the family members carried her on a cot and crossed the Sankarai river as the ambulance couldn’t reach the patient owing to lack of motorable roads. Later, she was rushed to the Bangiriposi hospital by the ambulance that waited for the patient at the river’s bank. Earlier on Suday, a woman gave birth to a child midway while she was being carried on a cot after ambulance failed to reach her in Chaulagheri village of Bagirposhi block in Mayurbhanj district.